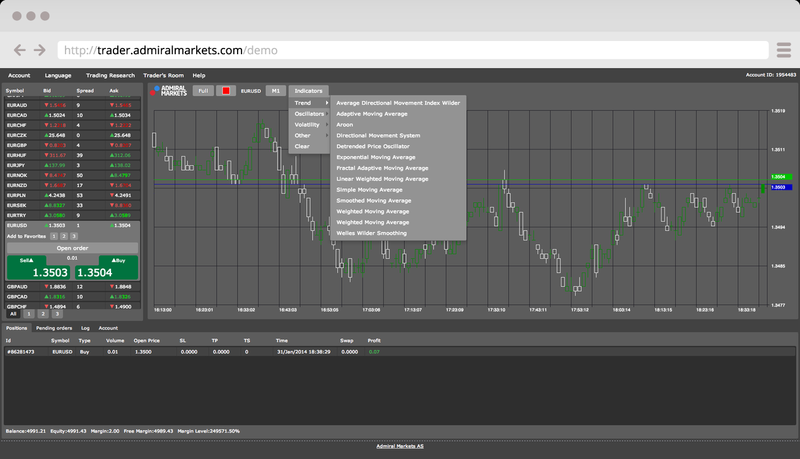 Estonian forex broker, Admiral Markets, has announced the launch of a new webtrader providing browser trading access for MetaTrader 4 accounts. The webtrader is based on a solution from broker technology provider TradeToolsFX, and for Admiral replaces a previous platform that had been licensed from the now defunct Xogee which was taken off the market in 2012. According to Admiral Markets, while the platform wasn’t developed in- house, they explained to Forex Magnates that the webtrader includes customized features such as access to their proprietary analytics, education and Traders Room. For brokers, the advent of web and mobile-based platforms that connect to MetaTrader 4 accounts allow clients increased flexibility in accessing and monitoring their trading. In terms of webtraders, the product provides a solution for Mac users, as MetaQuotes has not provided a native for the MacOS yet. Brokers have also reported to Forex Magnates that they often promote their firm’s webtrader solution to new traders, instead of the downloadable MT4 platform as it is easier for customers to access and less likely to be incompatible with existing software on a client’s computer. This occurs even for firms that incur additional variable fees for volumes traded on licensed webtraders. The launch of Admiral Markets using a licensed webtrader follows a trend of brokers electing to use 3rd party platforms instead of developing solutions in-house. Other examples from larger brokers include Pepperstone choosing Leverate’s Sirix solution, while FxPro tapped Panda TS for their webtrader needs last year.